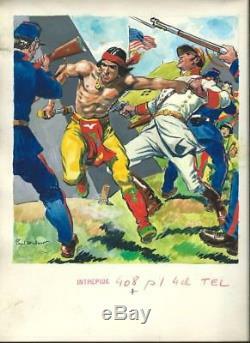 Beautiful original drawing in color by paul ordner, using Indian ink and gouache, for the cover of the magazine "the intrepid" n ° 408, published by world editions (del duca) in 1957. Format 25 x 32 , 5 cm. Annotations of the artist at the foot of the drawing and on the back. Paul ordner was one of the greatest French sports illustrators, but his talent was also exercised in comics, advertising, political or comedy. Attention I do not have time to provide other photos, but my descriptions are as accurate as possible (read my reviews). I do not accept any haggling, discount or request for "gift\In case of refund it will be imperative to return the object by registered letter to prove its sending. (no money order, no cash in envelopes). Payment within 4 days, otherwise litigation declared automatically, then in case of no response, warning for no payment given. The item "rare paul ordner original drawing + gouache cover review the intrepid # 408" is on sale since Friday, March 23, 2018. It is in the category "books, comics, magazines \ bd \ boards, original drawings". The seller is "funky_2" and is located in / in paris. This item can be delivered anywhere in the world. publication name: review the intrepid "buffalo bill"